Movies have been called uncompromising at a whim, but there have been few that actually deserve the label. 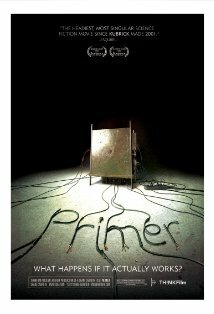 Primer is one movie that does. It is the most intellectually taxing movies I have seen in a long time. And it was constructed to be that way, without explanation and without dumbing it down for the average viewer - uncompromising. Aaron (Shane Carruth) and Abe (David Sullivan) are two engineers, who accidentally create a machine that allows anyone to travel back in time. This wasn't a "be your own grandfather" type of time travel. Rather it was a time-consuming, methodical, repeatable way to essentially relive a part of your own life. 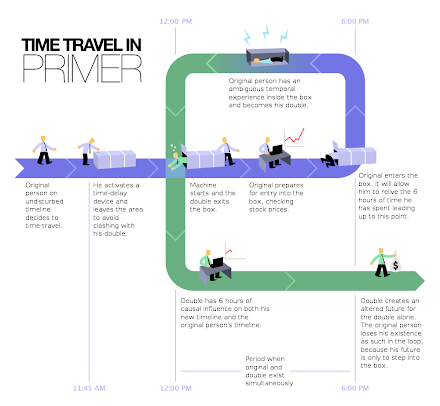 For every hour of time travel, a person spends three hours living, un-living and reliving the same hour. Wikipedia has a helpful(?) graphic below, that makes this clearer. The movie revolves around the layers of deception that the Aaron and Abe build around each other. What starts off as a means to scam the stock market, rapidly escalates into a matter of life and death as the father of Abe's girlfriend shows up comatose. Very quickly the story dissolves into a complicated mess of counter actions, using technology that neither understands, on a moral platform that neither respects. What sets the movie apart is the strictly matter-of-fact approach throughout. There are no elaborate set-up shots, no background clarifying flash-backs. Shot with a budget of just $7,000, the movie succeeds in bringing an immersive experience of chaotic life at the bleeding edge of new technology without checks and boundaries. The look of the movie is flat, overexposed and industrial with echoes of metal and garages. The dialogue is jargon filled, authentic, and impenetrable. The plot quirky, and unresolved. If you like closure in your movies, you will detest the mere existence of this movie. Even if you are used to making do with a little ambiguity, this film will test those limits. The movie isn't as much a story telling as it is an exploration of the what-if. If you ever thought about time travel, or wondered about the mind of an inventor, or worried about power without checks - you'd want to pop this DVD in and let go. Any undertaking, like recreating the seventh Harry Potter book on film, was going to be a difficult ask. Not only is the novel long, but the fans has come to expect more and more from each successive movie in the franchise. 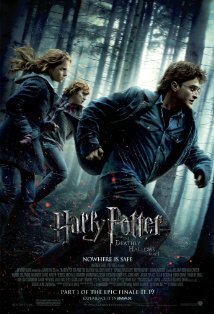 Harry Potter and the Deathly Hallows - Part 1 makes an attempt to scale new heights, but is only barely successful at maintaining status quo. The story is absorbing, but the movie seems tired and fatigued, and not in a oh-my-god-its-voldemort way. More in a please-stop-asking-us-to-make-more-movies kind of way. The movie starts off abruptly with everyone being mean to one another, the three young wizards looking dazed and confused and the audience being told that everyone turning into Harry is the only way forward. I do know the story, which is why it seems so jarring to start off without explanation in the middle of a scene. It seemed as if the focus was to just get on with it already. The hurry is even reflected in the scene where Hedwig gets shot down - no slow motions, no freeze frames, the action kept running away. And just as abruptly things slow down to a deliberate walk. Any movie that is part of a series deserves some scenes to continuity; I guess the assumption that this movie does not need to do that is what makes the opening scenes so presumptuous. If the movie had continued in that vein, I would probably have walked out half-way through, but it quickly recovers. We are given time to sympathize with the current state of affairs, the fall of the ministry, the takeover by the dark Lord's council, and the pogrom against the muggles. And definitely missing a couple of continuity conversations apropos the horcruxes, the kids dive into their search. Contrary to some early reviews, the whining scenes were not as onerous and the layering of pulsing action scenes definitely helps move the story along. The movie, at least the version we saw, seemed to have suffered cuts from the final release version. While Google called the movie at 2 hours 30 minutes, our screening lasted just about two hours. This could definitely help explain why we were so jarred as we started and went through the movies - maybe waiting for the director's cut on Netflix is in order. There is little that I can say to introduce a newbie to the series if they have not already seen an earlier Harry Potter movie. 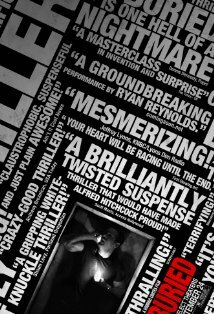 This movie definitely follows the earlier ones stylistically, yet bringing an additional layer of darkness to the proceedings. The locations are well orchestrated and bring aspects of the book to life. Use of hand held photography during some scenes adds tension, deservedly so. The kids look old, and not just older. But all said and done, you know you really have to go watch this movie, right? Ink is a strange sort of a movie, that defies simple categorization. It is at once dark, dramatic, uplifting and in places poetic. 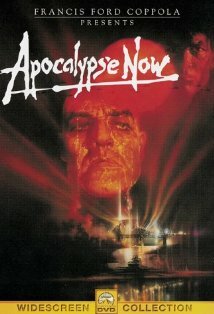 It wields horror and action as an means, but the end is a light, almost spiritual affirmation of love. Ink is a lost, tortured character, that inhabits an alternate reality of dreams, where the good (Storytellers) and the bad (Incubi) have always been at odds with each other. Ink wants to join the Incubi, as a way to make a place for himself in his world. To do so, he kidnaps the soul of a little girl, planning to deliver it as payment. As Ink makes his way with the girl to the Incubi, the Storytellers begin planning a rescue. They enlist the help of a blind Pathfinder named Jacob, and a fellow Storyteller Liev. While Liev gets caught herself in order to protect the girl from Ink, Jacob unveils his ability to tap into the "beat of the world" and manifest tiny physical changes. Meanwhile in the real world, the girl's father is busy with his own work, unable to spend any time with his daughter. As Ink reaches his goal of meeting with the Incubi, and Jacob sets in motion the grand symphony of chain reactions, the story comes to a climax as worlds and time come together for a thrilling finale. Ink, along with similar movies like the Pan's Labyrinth, exhibit a certain type of childish naivete in the story that works for them. The characters may seem fantastic and simplistic, but that only helps bring the form of the movie into focus. As a story Ink may not be the most accessible, but it works. Rather than ty to figure out exactly what is happening all through the movie, it helps to suspend not just disbelief but curiosity as you are carried on the fantastic ride through the world of dreams and reality. After having been burnt badly by Lost, we were skeptical about starting another science fiction mega series. But I've always heard that Battlestar Galactica was different. I remembered the intense hysteria (albeit at a much smaller scale than LOST) as it was drawing to a close. And it was rated 5 stars on Netflix and 9/10 on IMDB. So, well, we took the plunge. The series kicks off with a 3-hour miniseries. Based on the 1979 original, the mega pilot sets the stage of the renewed conflict between humans and their runaway creations, Cylons. As the 40-year old armistice between these adversaries is broken in a violently savage attack, leading human race to the brink of complete annihilation. The only thing standing between a complete Cylon victory is the lone aging decommission-ready spaceship - Battlestar Galactica, and the last few civilian ships that were able to escape the nuclear holocaust. There is a reason one is able to refer to events in this fictional universe as fact - the world created by the series is that immersive. Pulling together a mix of the familiar and the completely alien, BSG is able to create a believable universe with a deft touch of novelty. There is a new religion, and new Gods. Amen is replaced with "So Say We All". The military is just as regimented, the hangars just as rowdy. Fighter planes are called Vipers and they still engage in dogfights. But then the spaceships all have regular gravity, and rounds shot into space go ping ping ping; hits go boom (in case you did not get that last bit, space has no air and therefore no way for sound to travel). The sets are detailed, the special effects are elaborate yet believable. And the best part about BSG are the characters the push the science firmly into the background. There is the old dog veteran Admiral (Admiral William Adama), his estranged son (Captain Lee 'Apollo' Adama), the cocky yet talented pilot (Captain Kara 'Starbuck' Thrace), the reluctant politician president (President Laura Roslin), the schizophrenic genius with a deadly secret (Dr. Gaius Baltar), and the embedded Cylons. Faced by an unbelievable catastrophy and an uncertain future, the characters grow, adapt and learn to live with each other. The series channels a certain metallic, gritty feel of life in space. Camera work has a hand-held feel to it, with abrupt zooming especially during action scenes. Lighting swings between the darkness of confined space and blown out over exposure of alien suns. Some scenes carry a predominant blue cast. The scenes and camera work are as much a part of the narrative as the dialogues and characters. 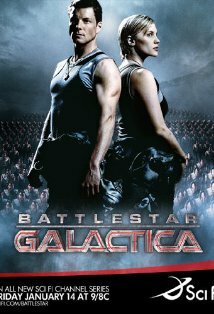 Battlestar Galactica is a engaging drama above all else. It is a story of human survival, faced with an unrelenting enemy. It is a story of camaraderie, fortitude, selfishness and betrayal. And it is a robot alien story that is worth investing a few weeks in. So Say We All. 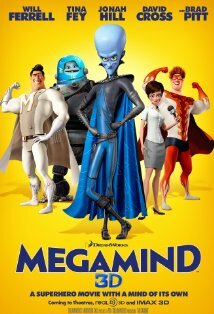 Megamind is a surprisingly touching yet funny story of a wildly successful super-villain, who finds himself in the unexpected position of having no arch enemy. As he yearns for the good old days of one-up-man-ship with the savior of Metro City, Megamind's one act of kindness comes back to haunt everyone with a vengeance. Megamind the movie plays off, repeatedly, on the concepts of relative good and evil. In the presence of overwhelming good, Megamind defaults to being a villain and in the sudden vacuum of success, he is reduced to dutifully dehydrating trash. While this may sound cheesy, the movie pulls this off with equal parts witty repartee and goofy aplomb. The story has enough depth (nature vs. nurture as NPR calls it) to keep the adults interested while being silly enough to draw laughs from the younger audiences. The 3D effects are moderate and well executed, a perfect example of a maturing genre that is moving away from its early nauseating excesses. The movie has its share of inventive characters and gadgets, starting with the Megamind's minion - the fish from his home planet that sits in a bowl, on a robot, wielding enough strength to crush a car. Then there is Megamind's extraordinarily useful dehydration gun which needs all but a drop of water to undo. And then his invisible car, which for some strange reason, lacks a panic button. And finally the ever-useful cloaking device that allows Megamind to take the form of anyone at all. The characters are over the top, artfully voiced and three dimensional. Will Ferrel is the quirky villain, whose opponent is voiced by Brad Pitt. Tina Fey weighs in, in her inimitable style while managing to sound fresh and different. All said and done, this is an animated super-hero movie - wantonly cheesy in places, but delightfully executed. The dialog is witty, pronunciation an atrocity, the evil is palpable and the eyes extraordinarily large. Most importantly the namesake sports a large polished dome for a head and comes with a skin hue of a popular primary color. Now who wouldn't want to see that.